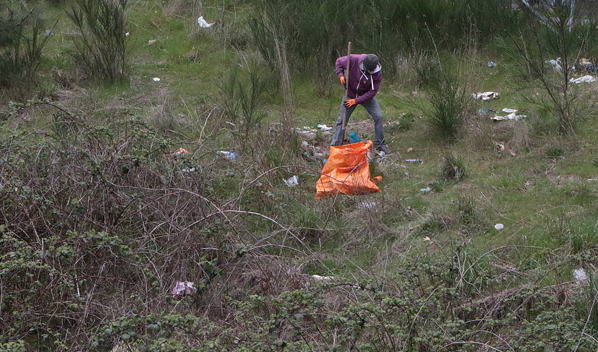 Working near I-205, primarily in the Lents neighborhood, Gary Mack sets out on another trash-picking-up mission. 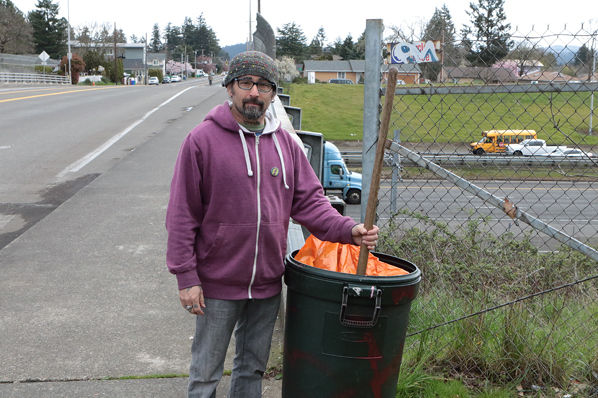 On a stormy early April afternoon, with more rain clouds moving in, Lents neighbor Gary Mack set out, shovel and barrel in hand, out to clean litter from around the Interstate 205 Multi-Use Path. 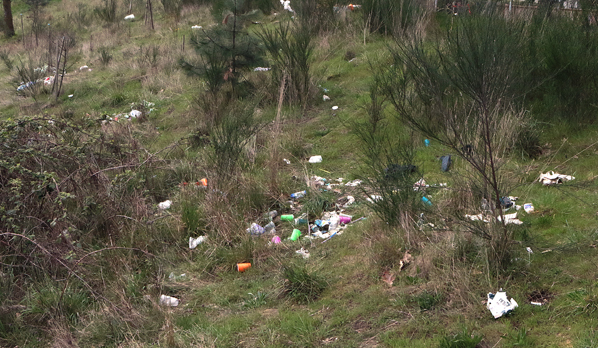 Mack said he’s been on his crusade against path-side rubbish for a couple of years now, and often is alone when he has a couple of hours to do his volunteer work. 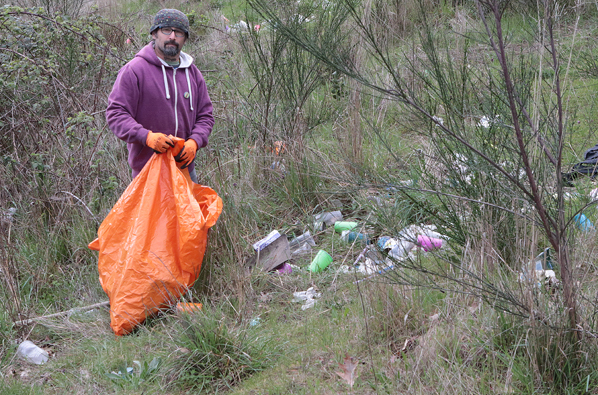 Seeing informal “garbage dumps” provoks this volunteer to clean them up. “I’ve been doing a lot more since so many people started camping along the path,” Mack told East Portland News. Asked why he volunteers to pick up the refuse carelessly discarded by others, Mack responded, “I just got sick of looking at all the trash and litter here; there’s just so much of it scattered around everywhere. “Somebody has to pick it up, and since few others were stepping up to help out, I decided ‘that person’ to do it, is me,” Mack reflected. It’s an immense and seemingly never-ending job, but Gary Mack keeps at it. 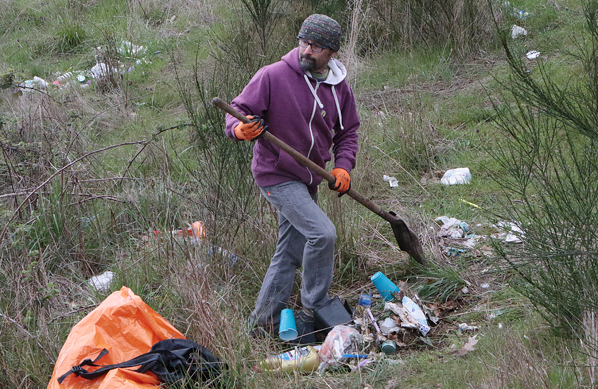 Thanks to the efforts of Gary Mack, stacks of trash are bagged and removed from public areas. After he bags the garbage, he hauls it to the edge of a nearby street, and alerts the Rapid Response Bio Team, an organization who contracts with the City of Portland, to come pick it up,” explained Mack. This intrepid steward of public areas can benefit from your help — either by stepping up to join him in bagging trash, or perhaps donating supplies. Because he isn’t part of a group or is supported by neighborhood associations, Mack says that getting basic supplies, such as large, heavy-gage trash bags and simple tools, comes out of his pocket. If you’d like to help Mack in his effort to clean up the city, offer to give him a hand. But, even more importantly, consider donating heavy-duty garbage bags and basic tools. You can reach him at: garymack@hotmail.com.